Frank Gee was born in 1948 in Canton, China. His father and mother were forced to flee mainland China during the Communist Revolution and Frank spent most of the first six years of his life in Hong Kong with his mother and his younger sister. His father worked for six years to save enough money to bring Frank, his mother, and his younger sister to the United States. Finally, they were able to join him in Nashville, Tennessee. Frank grew up in Nashville and graduated from high school in 1967. After graduation, he was accepted at the Memphis Academy of Arts where he majored in advertising, painting and print making. It was here that Frank painted his first watercolor, “Morning Mist.” He became deeply committed to watercolor as the medium that gives him the greatest freedom of expression. After graduating from the Academy in 1972, Frank worked as a layout artist, designer and illustrator for the Methodist Publishing House in Nashville, Tennessee. In 1974, Frank established the Frank T. Gee Studio to reproduce and distribute his limited edition prints. In the past two decades, many organizations have recognized Frank Gee’s work with First Place Awards, Purchase Awards, and Best of Show Awards. Some of the organizations include: Central South Art Competition, Tennessee Watercolor Society, Tennessee All-State Competition, and The American Society of Animal Artists. Organizations using Frank Gee’s work for fund-raising projects include: The Blue Bird Society of Houston, Texas, The Nature Conservancy, The National Wildlife Federation, The Tennessee Nature Conservancy, and WDCN Public Television. Articles featuring Frank and his work have appeared in numerous national periodicals and magazines. Some individual and corporate collectors of Frank Gee paintings are: John Denver, Jonathan Winters, Eddie Rabbit, Jeanette McIntyre, Frank Sinatra, McDonalds Restaurant Corporation, Nations Bank, First American National Bank, and Harris Press. 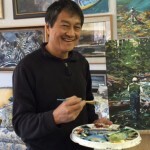 Frank Gee’s Asian heritage is an integral part of his life as well as his art. He believes that the simple and yet perfect rhythms of nature are reflected in the traditions of the orient. As an avid fisherman, kayaker, canoeist, hiker, and backpacker, Frank is intimately acquainted with nature – the source of all his art. GYOTAKU, the ancient Japanese tradition of fish rubbing, has been a recent focus in Frank’s paintings. Experimenting with varied sizes, numbers, and species of fish as well as the medium on which they are painted, has provided Frank with an on-going experiment in creativity. Frank Gee’s art combines the two diverse cultures that have shaped his life. The ancient traditions of his Asian heritage combined with the modern-day sophistication of his American upbringing make his fine art work unique and exciting.